Punjab NEET State Quota Merit List 2018: Soon Baba Farid University of Health Sciences is going to conduct an admission process for UG program in the medical and dental courses. The NEET UG Result 2018 was declared by the Central Board of Secondary Education (CBSE) 0n 4th June 2018. 85% seats are reserved under state quota. 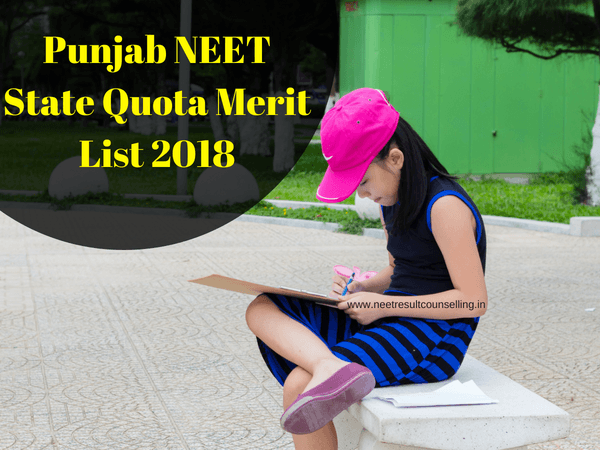 Quick update 29/06/2018: Punjab NEET Merit List 2018 has been announced. Check it from Below. After the declaration of NEET result, the merit list will be released by the officials and students who have qualified in it can fill their application for admission in the state medical and dental college. The merit list will have names of applicants who have cleared NEET examination and counselling will follow next to it. This time, female applicants are more than male applicants. There were NRI, OCI, Foreigner candidates too appeared for the exam. PUNJAB STATE – There are 23 NEET Examination centres available for the candidate and this time there were 11,849 candidates appeared in the exam. Now click on the official website. When you are on the website, click on the link of the merit list. You can see your name in the merit list. The counselling will be conducted in 2 rounds as you can see in the table. Here, it is assumed that applicant has been selected as per his/her score and rank in the examination and with reference to that merit list is constructed for both rounds. The candidate who did not join the college after the first round of counselling then their seats is will be available in the second round of counselling for other students. Class 10 and 12-mark sheet. Admit card, hall ticket and scorecard of NEET examination. Address proof and birth certificate of the applicant. Category and character certificate as well as domicile certificate of the candidate. ID Proof of the student. Past port size photograph of the candidate. Further, carry your identity proof for example- AADHAR CARD, Driving license etc. We wish you all the best for the result and we hope you will get the best college in future.